Apache CXF Fediz 1.3.0 will be released in the near future. One of the new features of Fediz 1.2.0 (released last year) was the ability to act as an identity broker with a SAML SSO IdP. In the 1.3.0 release, Apache CXF Fediz will have the ability to act as an identity broker with an OpenId Connect IdP. In other words, the Fediz IdP can act as a protocol bridge between the WS-Federation and OpenId Connect protocols. In this article, we will look at an interop test case with Keycloak. Download and install the latest Keycloak distribution (tested with 1.8.0). Start keycloak in standalone mode by running 'sh bin/standalone.sh'. 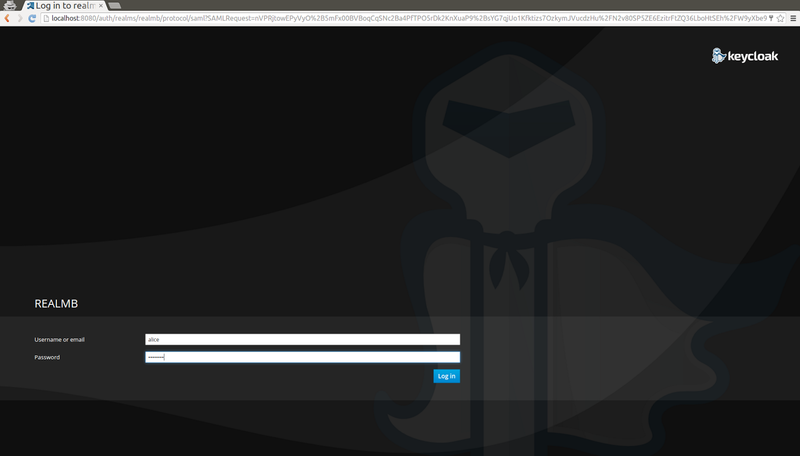 Click on the "Administration Console" link, logging on using the admin user credentials. You will see the configuration details of the "Master" realm. For the purposes of this demo, we will create a new realm. Hover the mouse pointer over "Master" in the top left-hand corner, and click on "Add realm". Create a new realm called "realmb". Now we will create a new user in this realm. Click on "Users" and select "Add User", specifying "alice" as the username. Click "save" and then go to the "Credentials" tab for "alice", and specify a password, unselecting the "Temporary" checkbox, and reset the password. Select "Access Type" to be "confidential". Now go to the "Credentials" tab of the newly created client and copy the "Secret" value. This will be required in the Fediz IdP to authenticate to the token endpoint in Keycloak. Finally, we need to export the Keycloak signing certificate so that the Fediz IdP can validate the signed JWT Token from Keycloak. Select "Realm Settings" (for "realmb") and click on the "Keys" tab. Copy and save the value specified in the "Certificate" textfield. Change the "url" value to "http://localhost:8080/auth/realms/realmb/protocol/openid-connect/auth". Change the "certificate" value to "keycloak.cert". Copy 'webapps/fediz-idp/WEB-INF/classes/realmb.cert' to a new file called 'webapps/fediz-idp/WEB-INF/classes/keycloak.cert'. Edit this file + delete the content between the "-----BEGIN CERTIFICATE----- / -----END CERTIFICATE-----" tags, pasting instead the Keycloak signing certificate as retrieved in step "1.3" above. Restart Fediz to pick up the changes (you may need to remove the persistent storage first). Select "realm B". You should be redirected to the Keycloak authentication page. Enter the user credentials you have created. You will be redirected to Fediz, where it converts the received JWT token to a token in the realm of Fediz (realm A) and redirects to the web application. The core Apache CXF dependency is updated to the recent 3.0.8 release. A new HomeRealm Discovery Service based on Spring EL is available in the IdP. Support for configurable token expiration validation in the plugins has been added. Various fixes for the websphere container plugin have been added. It can issue SAML (1.1 + 2.0) and SecurityContextTokens. It can validate SAML, UsernameToken and BinarySecurityTokens. It can transform tokens from one type to another, and from one realm to another. Wouldn't it be cool if you could ask the STS to issue and validate JWT tokens as well? Well that's exactly what you can do from the new CXF 3.1.5 release! If you already have an STS instance deployed to issue SAML tokens, then you can also issue JWT tokens to different clients with some simple configuration changes to your existing deployment. Let's look at the most common use-case first, that of issuing JWT tokens from the STS. The client specifies a TokenType String in the request to indicate the type of the desired token. There is no standard WS-Trust Token Type for JWT tokens as there is for SAML Tokens. The default implementation that ships with the STS uses the token type "urn:ietf:params:oauth:token-type:jwt" (see here). The STS maintains a list of TokenProvider implementations, which it queries in turn to see whether it is capable of issuing a token of the given type. A new implementation is available to issue JWT Tokens - the JWTTokenProvider. By default tokens are signed via JWS using the STS master keystore (this is controlled via a "signToken" property of the JWTTokenProvider). The keystore configuration is exactly the same as for the SAML case. Tokens can also be encrypted via JWE if desired. Realms are also supported in the same way as for SAML Tokens. The current principal is added as the Subject claim. The issuer name of the STS is added as the Issuer claim. Any claims that were requested by the client via the WS-Trust "Claims" parameter (that can be handled by the ClaimManager of the STS). The various "time" constraints, such as Expiry, NotBefore, IssuedAt, etc. Finally, it adds in the audience claim obtained from an AppliesTo address and the wst:Participants, if either were specified by the client. The token that is generated by the JWTTokenProvider is in the form of a String. However, as the token will be included in the WS-Trust Response, the String must be "wrapped" somehow to form a valid XML Element. A TokenWrapper interface is defined to do precisely this. The default implementation simply inserts the JWT Token into the WS-Trust Response as the text content of a "TokenWrapper" Element. As well as issuing JWT Tokens, the STS can also validate them via the WS-Trust Validate operation. A new TokenValidator implementation is available to validate JWT tokens called the JWTTokenValidator. The signature of the token is first validated by the STS truststore. Then the time related claims of the token are checked, e.g. is the token expired or is the current time before the NotBefore time of the token, etc. A useful feature of the WS-Trust validate operation is the ability to transform tokens from one type to another. Normally, a client just wants to know if a token is valid or not, and hence receives a "yes/no" response from the STS. However, if the client specifies a TokenType that doesn't corresponds to the standard "Status" TokenType, but instead corresponds to a different token, the STS will validate the received token and then generate a new token of the desired type using the principal associated with the validated token. This "token transformation" functionality is also supported with the new JWT implementation. It is possible to transform a SAML Token into a JWT Token, and vice versa, something that could be quite useful in a deployment where you need to support both REST and SOAP services for example. Using a JWT Token as a WS-Trust OnBehalfOf/ActAs token is also supported. Last week, I showed how to use the Apache CXF Fediz IdP as an identity broker with a real-world SAML SSO IdP based on the Shibboleth IdP (as opposed to an earlier article which used a mocked SAML SSO IdP). In this post, I will give similar instructions to configure the Fediz IdP to act as an identity broker with Keycloak. Select "Force Name ID Format". Finally, we need to export the Keycloak signing certificate so that the Fediz IdP can validate the signed SAML Response from Keycloak. Select "Realm Settings" (for "realmb") and click on the "Keys" tab. Copy and save the value specified in the "Certificate" textfield. Change the "url" value to "http://localhost:8080/auth/realms/realmb/protocol/saml". Change the "protocol" value to "urn:oasis:names:tc:SAML:2.0:profiles:SSO:browser". Select "realm B". You should be redirected to the Keycloak authentication page. Enter the user credentials you have created. You will be redirected to Fediz, where it converts the received SAML token to a token in the realm of Fediz (realm A) and redirects to the web application.